Ms. Lippert still has the pelt, the head and the feet. They’re in her freezer, awaiting the taxidermist. But she doesn’t have the boyfriend. “He ended up leaving me for a vegetarian,” she said. Rabbits are supposed to be easy to kill. The French dispatch them with a sharp knife to the throat. A farmer in upstate New York swears that a swift smack with the side of the hand works. Others prefer a quick twist of the neck. It didn’t seem so easy at the rabbit-killing seminar held in a parking lot behind Roberta’s restaurant in the Bushwick section of Brooklyn in November. The idea was to place the rabbit on its belly on straw-covered asphalt, press a broomstick across the back of its neck and swiftly yank up the rear legs. Done right, it’s a quiet and quick end. But it takes a little skill and a lot of fortitude, which some of the novices lacked. Nine people had paid $100 each to learn how to raise, kill and butcher the animals. One was a woman hoping to start a farm in the Bronx. Another was considering a move to family land in Montana. A couple dressed in black had traveled from the Upper East Side with their knives and cutting boards in an Abercrombie & Fitch bag. Sharleen Johnson, who rode a bus in from Boston, wanted to raise livestock in her backyard. “This is my gateway animal,” she said. In an age when diners scoop marrow from roasted beef shins and dissect the feet of pigs raised by people they’ve met, rabbit certainly seems like the right meat at the right time. American rabbit is typically raised on smaller farms, not in some giant industrial rabbit complex. The meat is lean and healthy, and makes an interesting break from chicken. For people learning to butcher at home, a rabbit is less daunting to cut up than a pig or a goat. And those who are truly obsessed with knowing where their food comes from can raise it themselves. Still, it’s a rabbit, the animal entire generations know as the star of children’s books and Saturday-morning cartoons, and as a classroom mascot. Buttermilk Channel in Brooklyn had rabbit on some menus shortly after it opened in late 2008. But after a table of guests walked out, it came off. Now the only rabbit served at the restaurant is disguised in a country terrine. “It seems to me that the more you can make rabbit not look like rabbit, the easier it is to sell people on it,” said the restaurant’s owner, Doug Crowell. But not everybody is squeamish. Some restaurant chefs are lining up for well-raised rabbits from small farms, using the meat in coconut chili braises, liver pâtés and even upscale sliders inspired by White Castle. “Every time I put it on the menu it flies out the door,” said Chris Kronner of Bar Tartine in San Francisco. Rabbit is also becoming popular among those with an interest in raising farm animals but without much space or experience. Sure, rabbits can be fragile. They get scared and have heart attacks. Heat or the cold can knock them off. They can be bad parents, abandoning their babies or worse. But they breed like, well, you know. That means they produce a lot of meat for not much money. And they’re clean and quiet — especially welcome traits in the suburbs. Ms. Carpenter believes anyone who is thinking of raising rabbits should kill one first. That is one reason she, along with Samin Nosrat, a Bay Area cooking teacher, conducted the Brooklyn class. The seminars were part of a larger East-West rabbit cultural exchange organized by the magazine Meatpaper. It was built around a series of rabbit dinners at Bar Tartine last month and at Diner in Brooklyn last November. As the pre-slaughter lecture in Brooklyn began, Ms. Carpenter prepared students for the moment. The rabbit events appealed to the kind of adventurous cook who signs up for weekend sausage-making classes, in part because rabbits are an especially good way to learn basic home butchery. The classes and dinners also attracted those seeking a slower way of living. “American palates are expanding and looking backwards, and rabbit is a big part of that, ” said Sasha Wizansky, the editor in chief of Meatpaper, who first suggested the bicoastal food exchange. Still, arguing that the country is in the middle of a rabbit renaissance might be overstating it. Rabbit never really had a strong first act to begin with. It has always been something of a crisis meat in America. Poor rural dwellers who moved to the city and European immigrants looking to assimilate found other animals to eat as soon as they could (the French notwithstanding). And although rabbit consumption spiked during World War II, when the United States government encouraged people to raise them for meat, it never translated to the supermarket. When the French food revolution changed American dining in the 1960s, rabbit in mustard sauce would turn up at the occasional dinner party or restaurant. But the country never quite got past the pets-or-meat problem. Ever since the Victorians began keeping them as pets, the relationship between the rabbit and the table has been uneasy. “It’s this weird association with Easter,” said Sean Rembold, the chef at Diner and at its sibling restaurant next door, Marlow & Sons. Chefs have to tap-dance between customers who are excited to eat rabbit and those who find the mere idea intolerable. And despite its reputation as a staple in frugal times, rabbit isn’t cheap these days. A seven-pound live rabbit might weigh four pounds cleaned and cost a restaurant $25 to $30. D’Artagnan sells a whole fryer rabbit for $36.99 on its Web site. Chefs searching for local, fresh rabbit can’t always find enough. In the Bay Area, cooks wait for a call from Mark Pasternak of Devil’s Gulch Ranch in Marin County. Along with his wife, a rabbit veterinarian named Myriam Kaplan-Pasternak, he raises the most coveted rabbits in Northern California. They are such believers in the economic and health benefits of eating rabbit that they travel regularly to Haiti to teach families to raise rabbits on foraged food. The Pasternaks and their two daughters were in Haiti during the recent earthquake, when they turned their attention from rabbits to rescue. 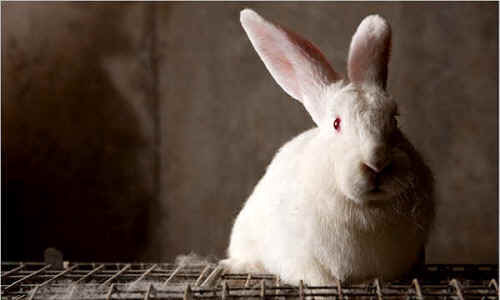 Mr. Pasternak began growing rabbits about 12 years ago for his mother-in-law, who is from France. She brought a French chef to dinner and word leaked out to Bay Area cooks. Soon, Mr. Pasternak was selling rabbit to Chez Panisse and the French Laundry. “I went from two to 2,000 in no time,” he said. Not that he butchers 2,000 rabbits every week. Usually, it’s about 100. But he is preparing to quadruple the number of breeding rabbits he keeps, making chefs in the Bay Area happy. Some chefs in Manhattan turn to John Fazio, who sells his rabbits with most organs intact to restaurants like Savoy and Marlow & Sons and to a few Italian markets on Arthur Avenue in the Bronx. Mr. Fazio started raising rabbits near his home in Modena, N.Y., 80 miles north of Manhattan, after an accident left him unable to make a living as a truck driver. A couple of years ago, a chef at Cookshop in Chelsea started ordering them. Others followed. Now he sells 300 to 400 a week. He slaughters to order. And he has a signature. “If they don’t have a rabbit with a head on it, they don’t have a rabbit from me,” he said. Both he and Mr. Pasternak raise a mix of New Zealands and Californians, the two most popular meat breeds. New Zealands are longer and thinner but produce more babies. Californians are a little meatier. Mr. Pasternak adds in some tri-colored Rex rabbits, which are used in the fur trade and have a good temperament. In the kitchen, rabbit can be a challenge. The bones are tinier and more fragile than those of chickens, making splintering a constant concern. The meat sticks and clings in an endless number of small nooks and crannies. Like chickens, rabbits have parts that cook differently. But it’s hard to roast the whole animal at the same temperature without making some meat too dry or tough. The hind legs especially almost always need a moist, slow braise. For frying, plenty of cooks like to give them a good soak in buttermilk or a light brine. The saddle, or center portion of the rabbit, is a different story. The meat can be fried, but it can be dry. So it helps to apply a bit more finesse. For a salad of bitter greens and rabbit he served at the Brooklyn rabbit dinners, Mr. Rembold removed the legs, sautéed the rest of the rabbit whole, then removed and sliced the meat to toss with frisée and a mustard dressing. To make the most of all bits of the rabbit, Mr. Rembold suggests a sausage made with a medium grind mixed with some fatback or chicken skin to enrich the lean meat. Ms. Nosrat likes to use up all the scraps and legs in a long-simmered ragù. Angelina Lippert, the woman who took an Abercrombie & Fitch bag and her boyfriend to the class in Brooklyn, brought home the legs of the rabbit they killed and braised them with almonds, apples, Calvados and cream. The saddle, kidneys and heart went into a rolled roast with garlic, sage and rosemary. The killing itself was a little more intense than she had expected, she said. “When I was the first person to volunteer to break the neck, it all seemed so easy and emotionless that I didn’t realize until after I’d done it that I was shaking,” she said. But she recovered quickly. After all, there was a rabbit to dress. Ms. Lippert still has the pelt, the head and the feet. They’re in her freezer, awaiting the taxidermist. But she doesn’t have the boyfriend. “He ended up leaving me for a vegetarian,” she said.